Well that idea has been shot to hell because I love these guys. 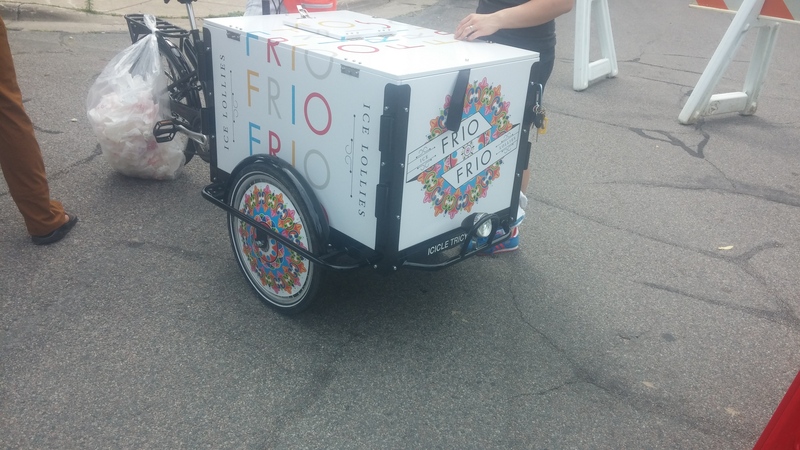 I’m gonna just go right out and say it from the start, Frio Frio I believe is the best cold treat truck in the Twin Cities right now. 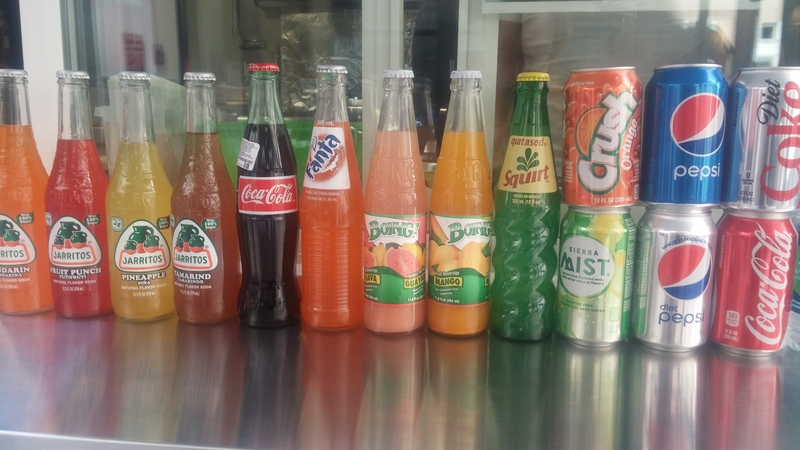 I’m sorry Geno’s, Cranky’s, and Fro Yo, but these guys are just plain cool (unintended badum-ching), unique, delicious, and their product fits their setup perfectly (unlike a certain ice cream cart with a not-so-smooth product due to the non-traditional ‘refrigeration’). But here’s the deal. 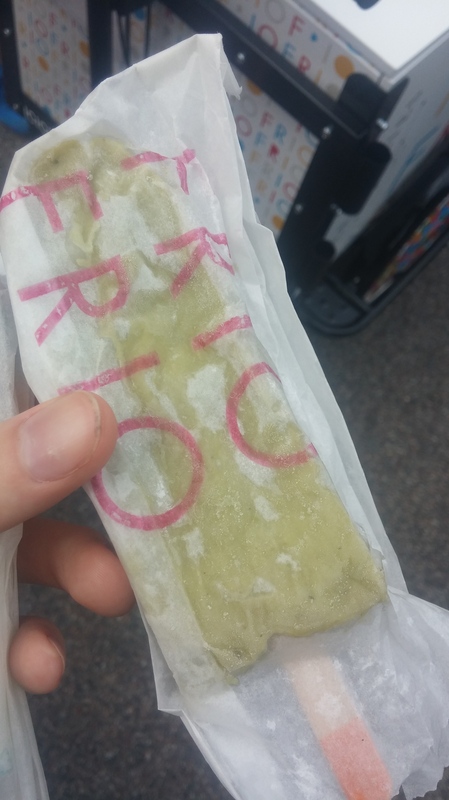 Taking note from similarly traditional frozen treats found on the street in Mexico, Frio Frio makes specialty popsicles out of (mostly) natural ingredients with delicious twisted flavor combos, both contemporary and sort of classic Latin-inspired. These include, but aren’t limited to, Avocado-Lime, Grapefruit-Carrot, Strawberry-Balsamic-Basil, Kiwi-Apple, and ‘Piñata’ (oh I’ll tell you about this later, be patient). Great treats for kids and adults alike, though I say stick to the adults cuz which kid is really going to appreciate anything more or less so long as it’s cold and has sugar? But I’m not going to try thinking of anything else to lengthen this intro any more, I just wanna dive right into the scoring! By the way, I ended up grabbing some popsicle pictures from their Facebook page because you NEED to see what the others look like. It was a bit tricky picking, but something told me I had to try the Avocado-Lime, really get that proper Mexican inspiration, and the Piñata. They were both so good, firm but not hard or particularly icy, they each licked up easy, I mean the texture was just ideal. 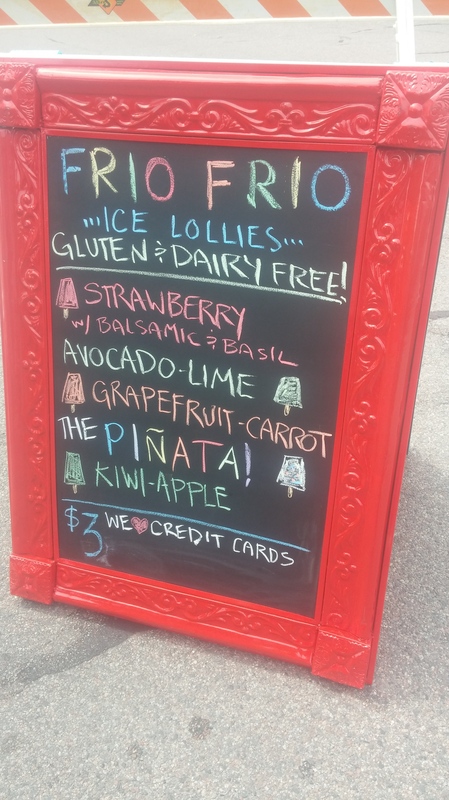 The avocado was fantastic, actually making it smooth and creamy, almost between regular popsicles and those gelato ‘popsicles’ we see sometimes. And of course the flavor came out great (if you haven’t had avocado desserts yet, you need to try them, it actually works really well when held back by other ingredients; almost custardy with its richness, and with a smooth, round green flavor) and was balanced nicely with the lime. 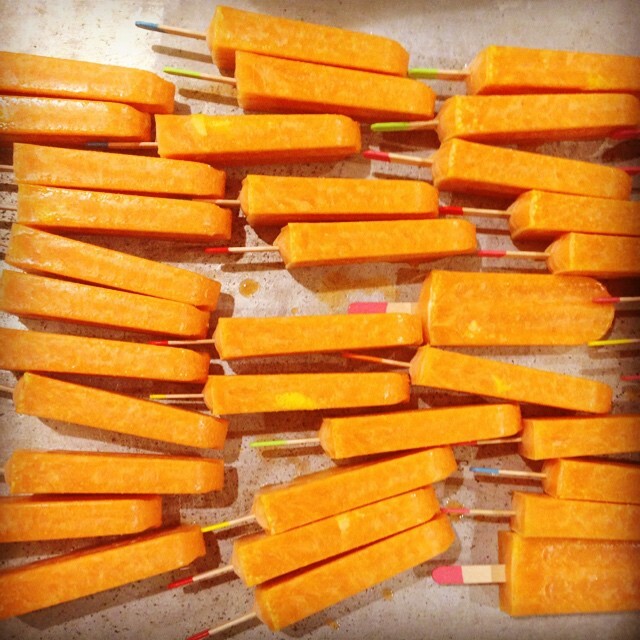 Now, the Piñata… Lemon and Coconut Water popsicle suspended with, and I’m not sh*^@ing you, Sprinkles and Gummy Bears. And it is GOOD. I swear, I never thought I’d love sprinkles and gummy bears so much, but these are sort of the perfect flavors to bring them out in, without just tasting like extra pieces of artificially flavored sugar. Not to mention you get some fun, childhood-like things to chew as you go through it. 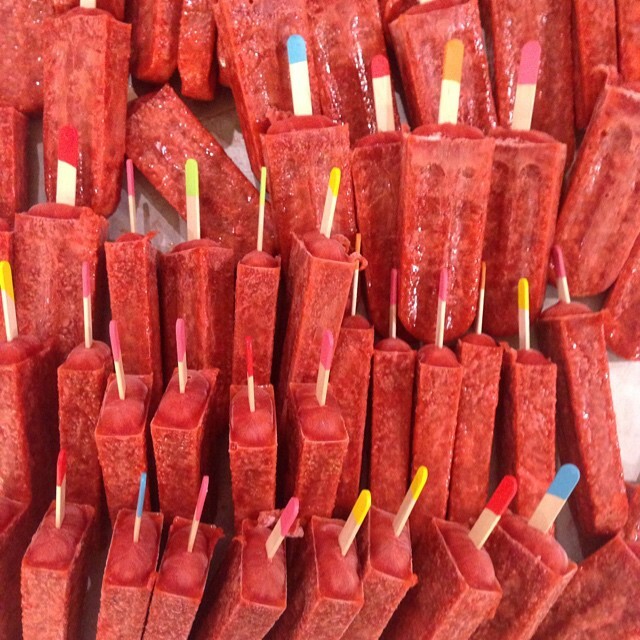 I can only imagine how tasty the other popsicles are. 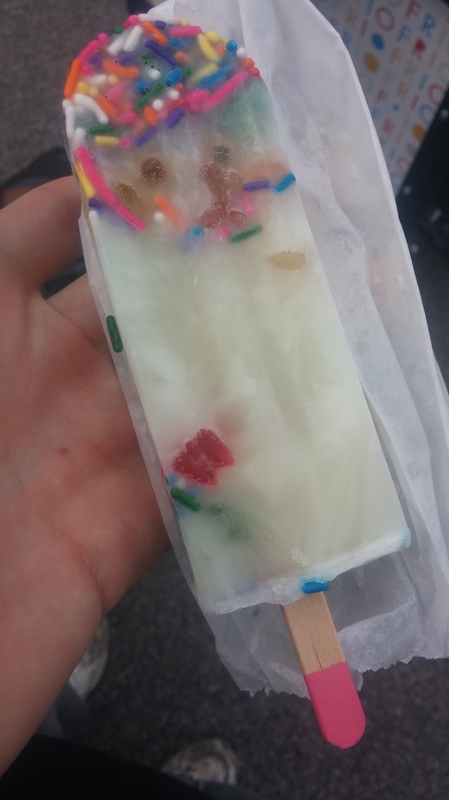 What can I say, you walk down a hot street, licking and munching a delicious popsicle in one hand, the fingers of only one hand getting a little sticky from the bit that’s melting off the popsicle, but you don’t care, it’s not impeding you at all and it reminds you of summers who knows how long ago. It’s only $3 each, I mean come on! And they each certainly have a good amount to them, and flavor to make every dollar worth it. Reach in the box, grab the popsicle, hand it to you, and off ya go (if you so desire to leave immediately). 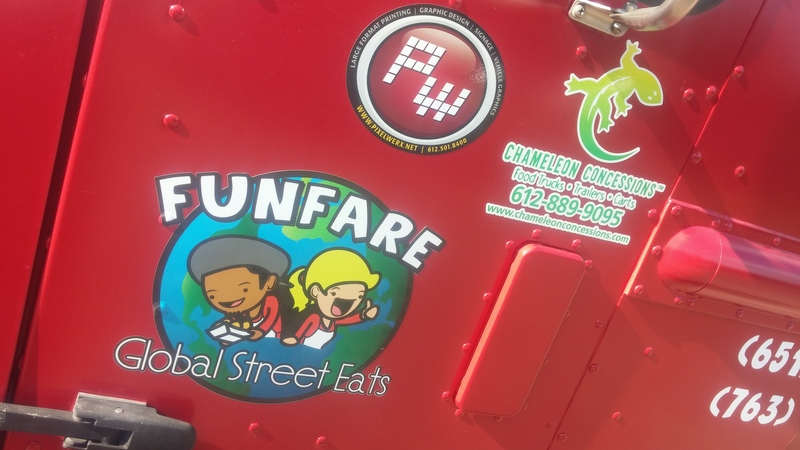 It just feels like the whole cart nails it for me; the box has a cool design, the colorful theme runs throughout (even on t-shirts), name is catchy and actually makes sense, personality is distinctly bright and bubbly, the product is simple but unique and delicious, and it actually has a tie-in to traditional street food elsewhere. They’ve totally got that ‘Adult Popsicle Cart’ feeling to it that brings you back just enough to when you were younger, slurping on a frozen lolly during a heatwave; I swear I half expected I would find that classic messy smear of popsicle on my lips and tongue when next I saw a mirror. And hey, if they have ME this excited and raving about it, they must be doing SOMETHING right. 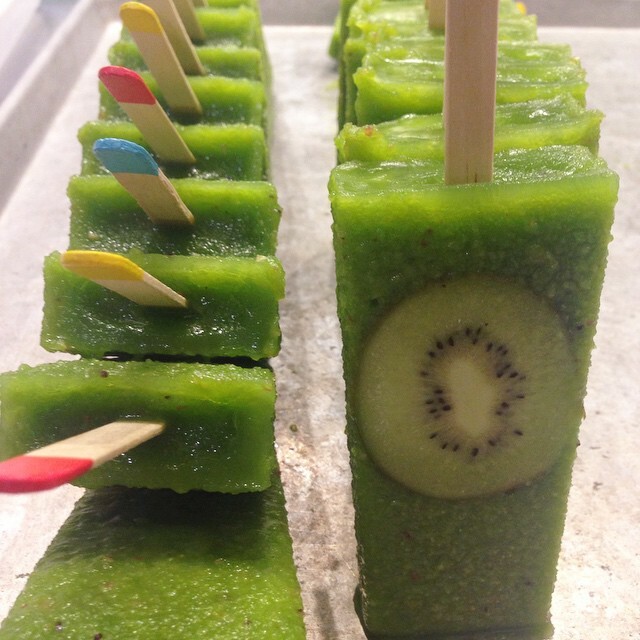 I mean heck, all their popsicles feel like a ‘Toe Ring’ to me (maybe not the kiwi-apple, but that’s me). Because I don’t think it’s fair for Potter’s Pasties to be the only truck ever to go over 50 points, and because there IS that really social, easy talkative feeling when you go there, likely an increased openness for random chat when the people shelling stuff out aren’t behind a window and above your head. 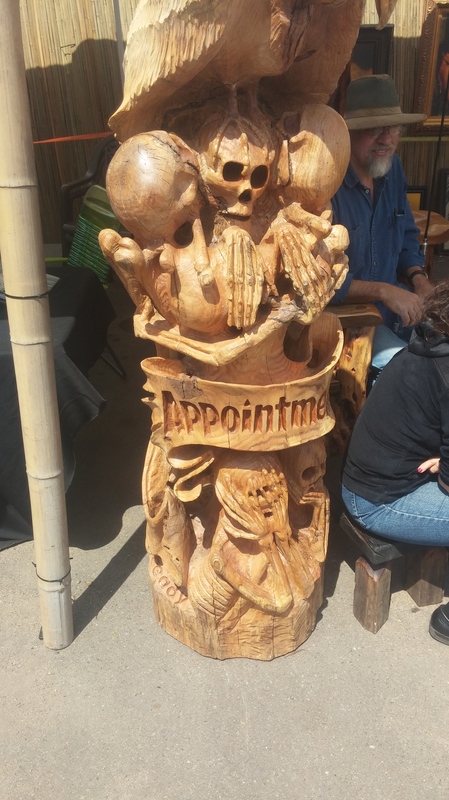 Besides, the two shelling this stuff out are nice, hospital, and have fun personality, like a lot of people in the mobile vending service biz; just got to see it more today and here. 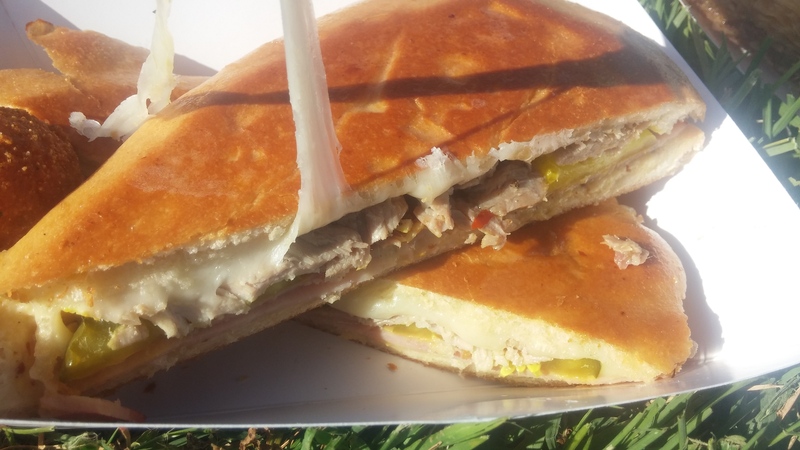 Frio Frio offers a product that is perfectly ideal to add on the tail end of any food truck luncheon day or just as a quick indulgent treat whenever one gets the chance. Though I’m not one for feeding kids really good products, it offers an actual strong possibility for anyone to go and find SOMETHING that fits their tastes and desires for cheap. 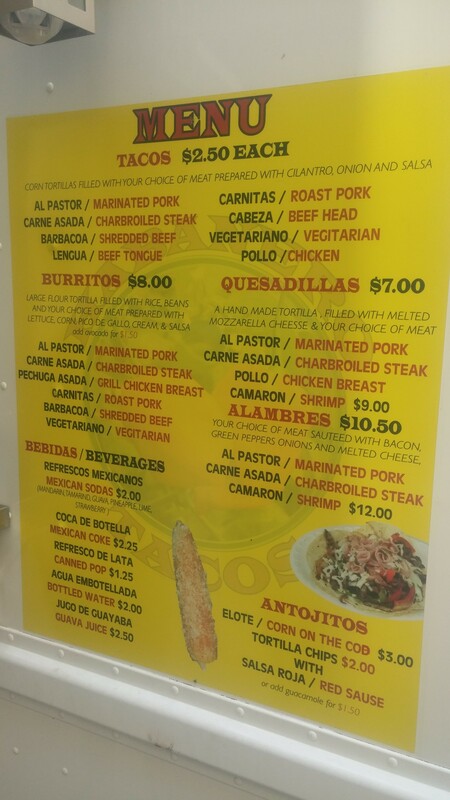 And as for which ones to get, you can’t go wrong with anything I don’t think, but if I HAD to narrow down the ‘must-haves,’ at least for your first visit, I would definitely still go with my own choices of Avocado-Lime and Piñata. They’re both highly unique, indicative of the original influence, and come on they’re delicious. It’s a little late in response (though aren’t most of my posts usually nowadays? 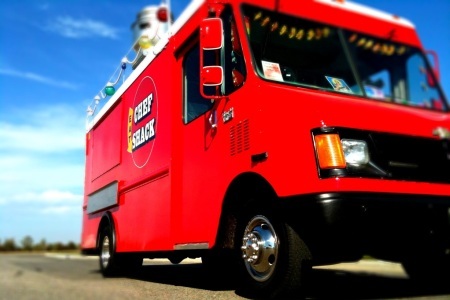 ), but I do always love featuring the Trucks that achieved the graces of making City Page’s “The Hot Dish” blog’s top 100 Favorite Dishes for the year. I wanna make it a yearly thing! No promises of course… I am quite fickle… and forget things… SURE I’ll have another shot of Vodka. 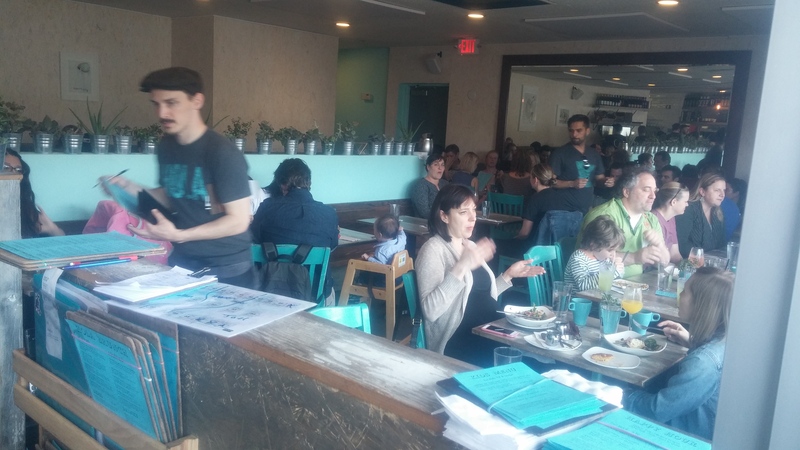 Their menu is quite frequently changing with whatever local ingredients they can get their hands on, but it’s not often one won’t find at least a few dishes with goat meat and/or cheese on the menu. 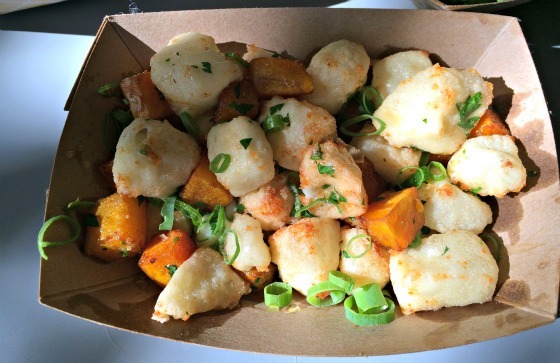 And they take this latter up to an epitome of experience by lightly frying curds of it and serving with roasted butternut, some spring onions, and a drizzle of honey (my new favorite cheese curd companion forever). Again, something I dearly need to have at some point… here’s hoping for a rally. I may still hold strong reservations and annoyances about this truck (don’t ask me why, I’ve probably lost proper reason for it long ago), but one can’t argue their food always gets results in those willing to spend the extra buck to attend their mobile or standing business. Usually getting renown for the lobster, this year highlighted one of the best southern combos to ever grace the table: Shrimp and Grits. I know, the last word strikes terror and disgust into many a heart, but done right than oh my god… I’m still vary happy to have gotten it at Surly myself. 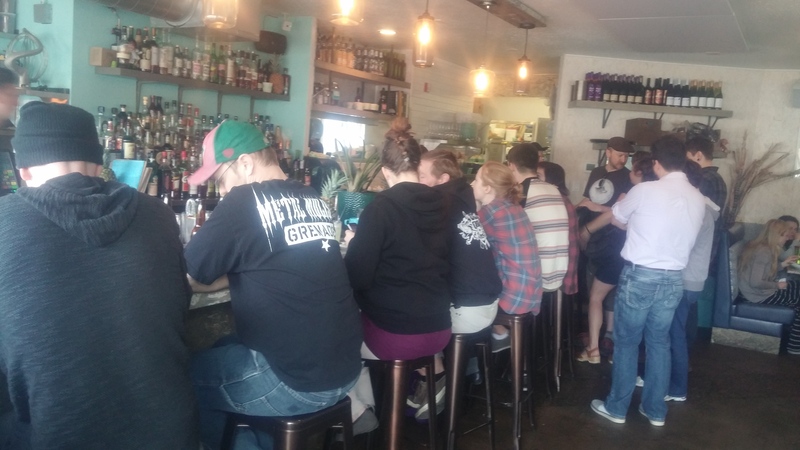 Not surprising to see them on this list again, this time for Brunch! The restaurant location serves out a dish composing of a bile of hashbrowns, ‘secret sauce,’ and some big chunks of lamb topped with basted eggs (which, if they’re PROPER basted eggs, are easily the most sinful and delicious way to eat them whole I swear). 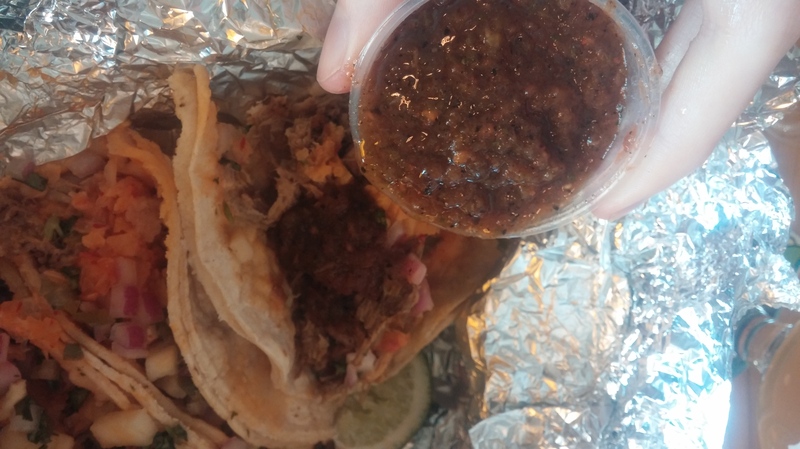 I almost probably shouldn’t even be mentioning these gals on the post today, since the restaurant focus has almost NO connection to what the truck turns out, instead serving out bigass servings of classic BBQ. And it’s not a bbq joint without a giant parchment-paper-lined platter dolloped with practically one of everything, like grabbing a charcuterie board at the more hipster-ish locations but with hot, soul-fulfilling smoked meat… and more of it. As it’s apparently some of the best bbq in the Twin Cities, this little selection of pork and beef moved itself rather high up on the list. 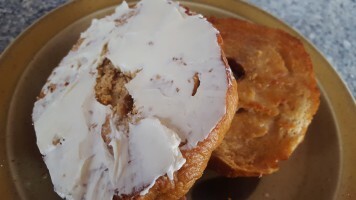 Of course the local famed belter of the stuffed corn-dough sandwich is now turning out a dessert version, stuffing sinfully smooth vanilla ice cream in a sweet cookie dough filled with butterscotch, fritos, and corn flakes. Why didn’t they have THIS at brunch!? That’s right, they got on twice! (And they’re not the only ones, damn Spoon and Stable… making me want to go to you when I don’t have enough moneh) And fitting we end on something that actually could come out of the Truck itself, their classic masa ‘flatbread’ bun stuffed with sweet, soft plantain, rich beef, tasty pickled onions and of course some sauce. It then gets kicked up to 11 when eaten in restaurant and served with those amazingly thick, crunchy Yuca Fries that I just think are perfect. No wonder they’re at the top of the books. Well, that’s the second year for me done and taken care of, we’ll have to see how the following 2015-16 season goes. 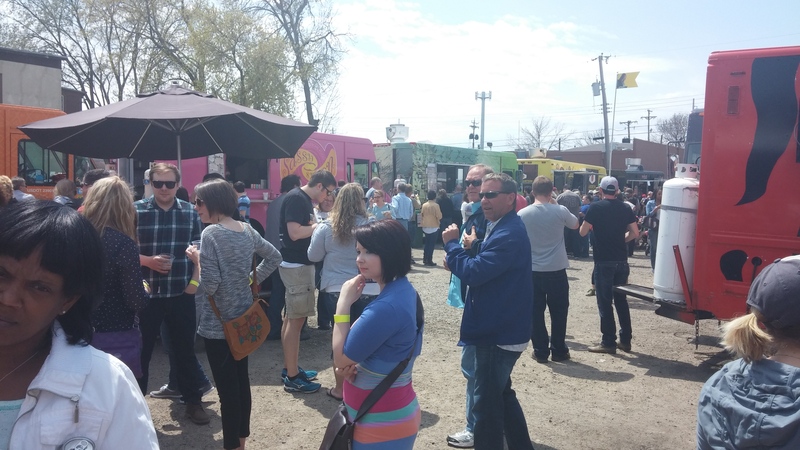 Will more trucks move to restaurants and fill the brackets, or will a resurgence in interest for starting mobile operations take precedence? Find out next time (he says in announcers voice as if he was coming back to this in a week and not a whole year)!! 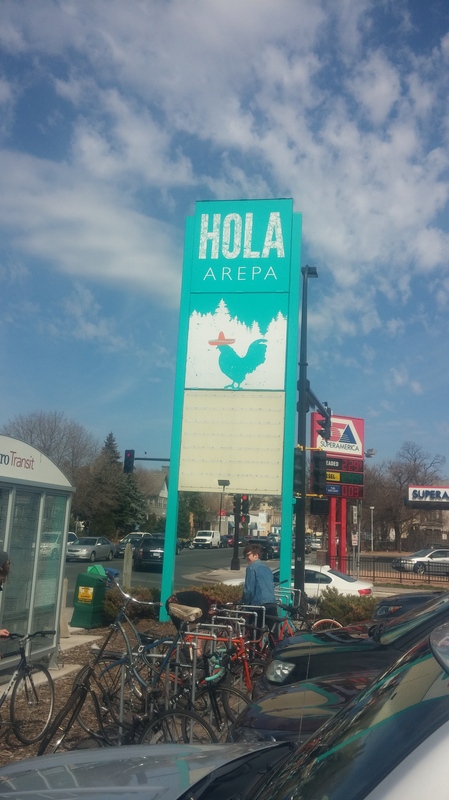 Getting to Hola Arepa’s Restaurant in Uptown, across the street from the legendary Pat’s Tap, was a long road in coming… now granted, I never paid attention to when they opened, so I don’t know HOW long a road, but I can figure at least a notable few months right? Having only two days off a week doesn’t help either, especially figuring they aren’t open on one of them (who’d figure it was Monday and not Sunday? Good thing there’s Brunch). But I got out recently so yay. 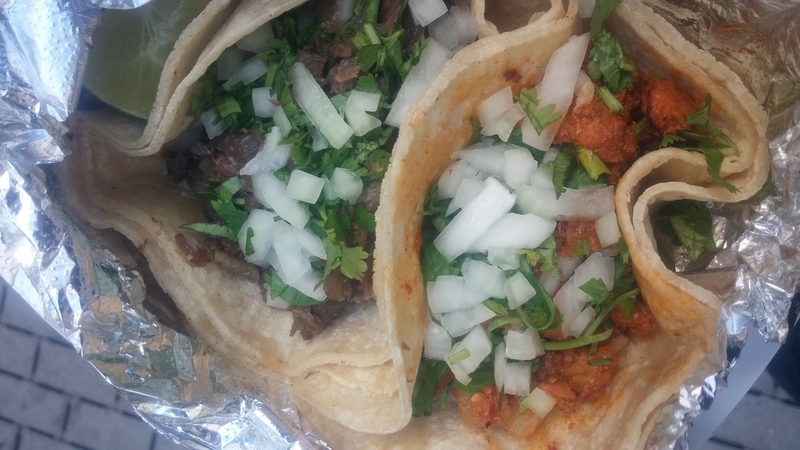 I’m going to start off by saying this, I mean I expected them to be good of course (there’s a reason the truck’s been so popular), figured a really sweet Mexican lunch ‘sandwich’ spot reminiscent to a truck experience, but I didn’t think they’d be THIS good. Hell this was a TRIP on level with a trip to Pizza Luce, and you know how good they are. Especially during Brunch, which happened to be the time me and my dear sister ended up making it there. It was here that I discovered, to my intense satisfaction, how popular the spot has become, garnering a half hour wait for a table for two (so one can safely say that, unlike the truck, not the best spot for those trying to get in and out fast, at least unless you get to brunch early). Not that we minded, it gave us the opportunity to grab some rather badass cocktails. Here comes my first happy surprise, seeing a menu full of fun, modern Craft Cocktails reminiscent to some of our favorite finds at local bars such as NE Social, Pat’s, and Marvel. 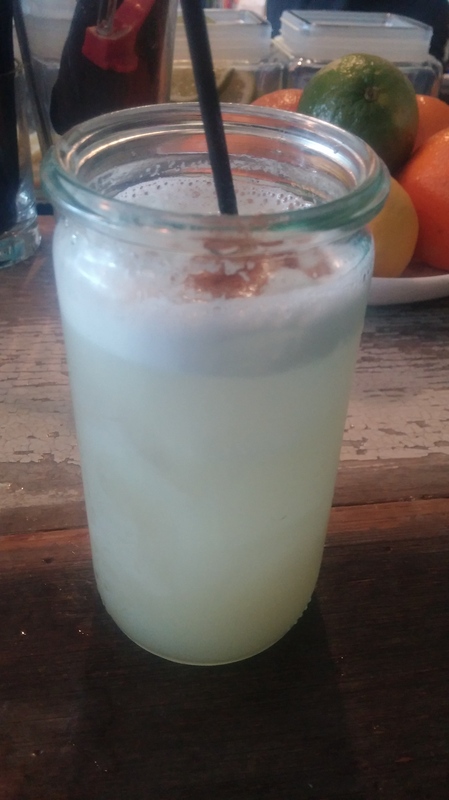 For my sister, the Seasonal Horchata Cocktail, based off a house-made ‘spiced whey horchata’ with flana cor 4yr rum, bitters, and cinnamon. A fantastic, thought-provoking improvement on the classic spiced rice-milk drink in the form of a ‘milk punch’ (look it up, they’re delicious and I want to make one). For myself, because the sister already grabbed the cocktail I wanted, something with the name of Paradise (okay, I forgot to steal or take a picture of the menu, thought the website would have it okay!? I was wrong) filled with Tropical flavored Aged Rum, Bourbon, Vermouth, Bitters, Lillet (if I remember correctly), and other cocktail things. 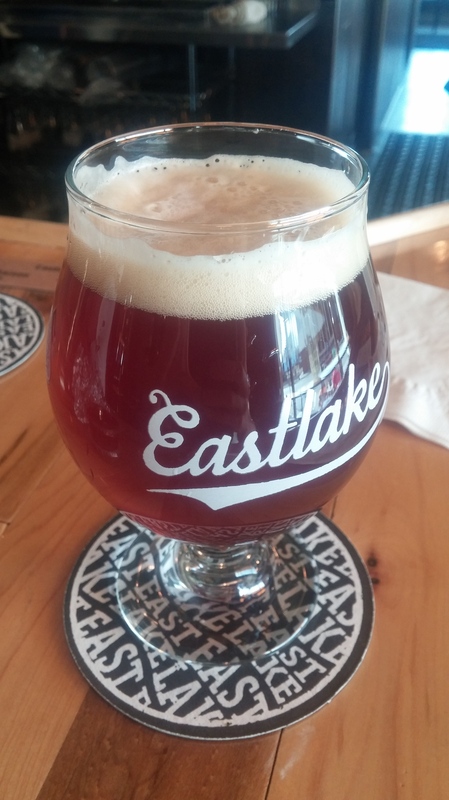 Smooth, delicious, refined, definitely a great thing to sip on the benches outside during a beautiful sunny day. I absolutely love the pineapple flavor it got; subtly present, not super bright or artificial, just that deep tropical undertone lifted up and fused with the aged rum and whiskey spirits, mixing with the botanical-infused spirit elements to bring body, sweet complexity, and that amazing mouthfeel. But it was gone, and we got a table, and another cocktail was deserved, thus I grabbed an “Hola Fashioned” based out of well-aged rum with a dash of smoky Lagavulin Scotch to subtly tie in to the original cocktail, giving it just a light, subtle bit of that whiskey barrel-aged whiskey essence in the back while the rest fills with that delicious mix of orange aroma and rich sugar spirit. The sister got a seasonal Sangria, Red, with blueberries and another fruit. Let me just say, sangria is almost never something I crave or ever really FEEL like drinking unless it’s just in a fridge at a party (or offered to me), but THIS is one I’d go back to. But that’s enough talking about booze, let’s get to the actual food. 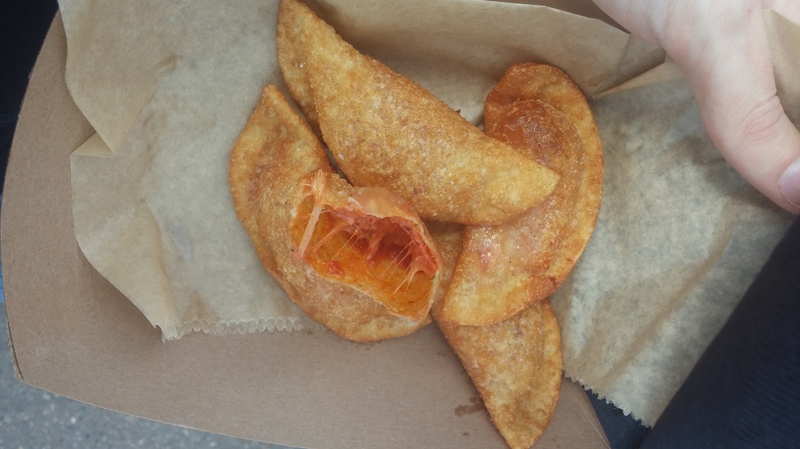 There’s been plenty of articles written about this already I’m well aware, in fact I do wish I could go back for the Chicharone and Arepitas dishes, but that doesn’t mean I can’t still enjoy my own experiences right? It’s not a trip without an Arepa, and I got to grab one I had yet to experience so far, of the ‘Breakfast’ Variety. Stuffed with a Fried Egg, Beans, the white cheese Cojita and some Tomatoes + Aioli, we decided to take the next step and also add in Pork. Which I’m glad we did, because without it I would imagine it’d be a very flat, not-so-full sandwich. 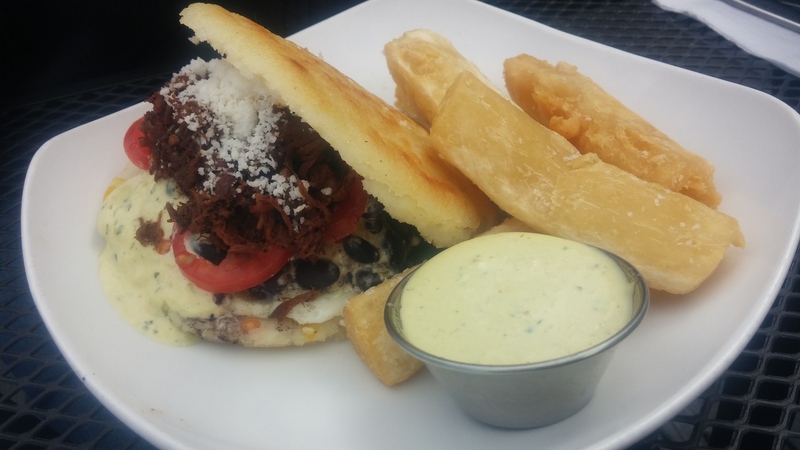 Along with the meat, it certainly met the basic requirements, though I feel I’ve found more enjoyment with their other arepas (more of that rich, juicy experience, plus the dough today felt a little denser than usual). The real highlight of the order, though, was the Yuca Fries. God these fit literally every feature that I look for in PERFECT fries (at least of the thick-cut variety). 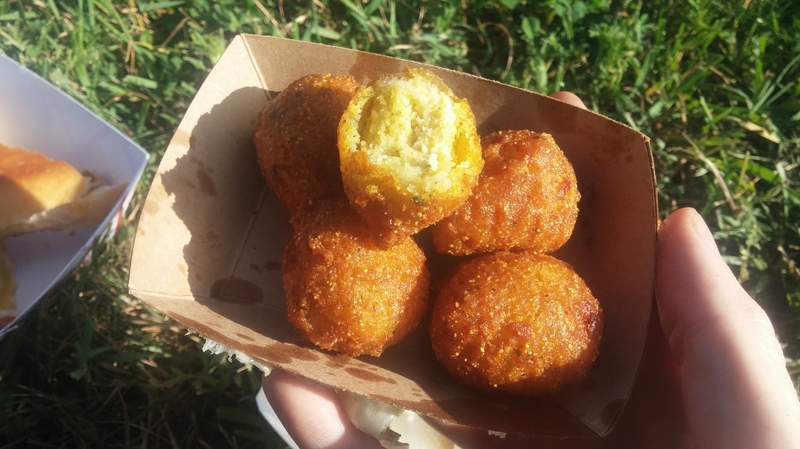 Crunchy and crispy outer crust, soft pillows inside (maybe a bit more starchy than the really fluffy white potatoes), and big, these were a delight, especially with a side of aioli. Main Course happened to be Cachapas (yellow corn pancakes) and Fried Chicken; the latter a drier style with thick crust, truly ideal in those ‘chicken and waffle’ experiences when you just wanna cut it up and get a big piece of peppery fried batter in every bite of food. 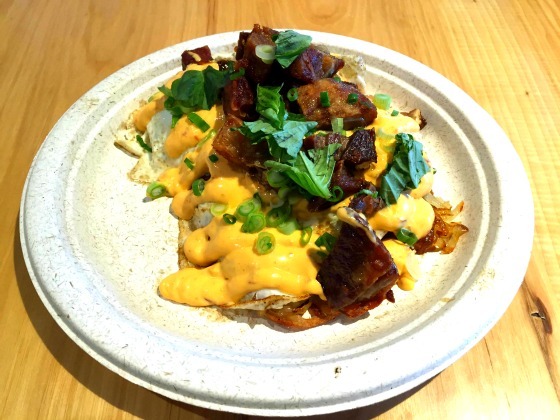 The pancakes came super soft, naturally savory-sweet highlighted from the corn sprinkled on top, and acting as an amazing base to carry the flavors of the accompanying egg, bacon, jalapeno… and of course that syrup. Easily the best part on that plate, for it truly completed that smorgasbord flavor of the ‘full pancake breakfast’ we expect, and without needing to cover the whole plate in calories. Just a few drops over my giant forkfuls of food, and that distinctly unique and deep chipotle-maple flavor could be picked up amongst everything else. 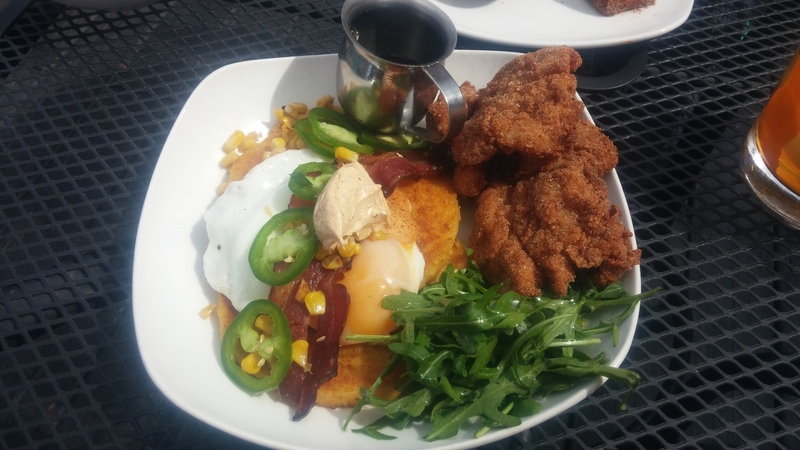 It was classic, yet modern, yet traditional in a different way, and all executed well to convene in a mass that hit everything I wished for at Brunch (unless I’m craving hash brown skillet sorta thing, but that’s another day). 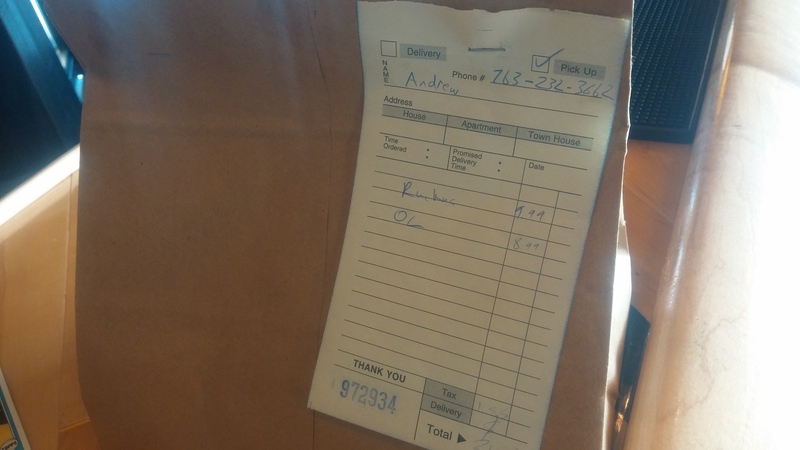 Let’s move on, two more small items to get through (btw, yes there was leftovers… not much, but some nonetheless). Nowadays I love granola, yogurt, fruit and honey in the morning, and their version is easily now one of, if not MY, absolute favorites. 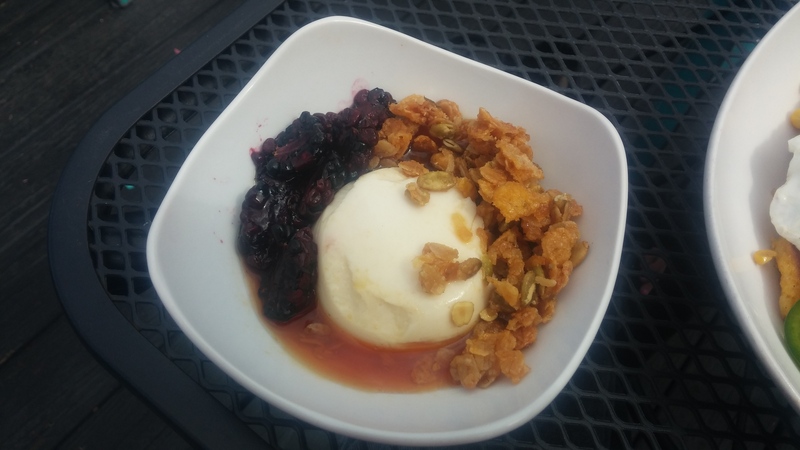 A simple Yogurt Flan (baked custard, panna cotta, etc) with fresh Blackberries and a Cornflake-Pepita ‘Granola,’ which if anything was more of a candied mix of the two, with some sort of syrup on bottom (my money’s on a flavored Agave, but who knows? Maybe it was just honey based). Whatever the details were, it was good, and a perfect way to have a little dessert at breakfast time; I want more of the ‘granola,’ that was just sweet and crispy and addictive, they need to make an actual cereal out of it. Despite that, I had to try a certain actual dessert, the Mini “Churro.” Both I and they use the quotation marks for good reason, because I’m pretty sure they don’t use the same crème-puff-style dough which churros are usually made from. 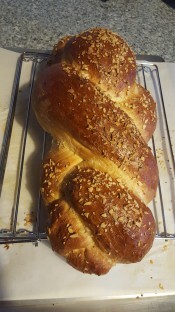 It came out more… actually, now that I think about it, it was basically like a coffee cake. 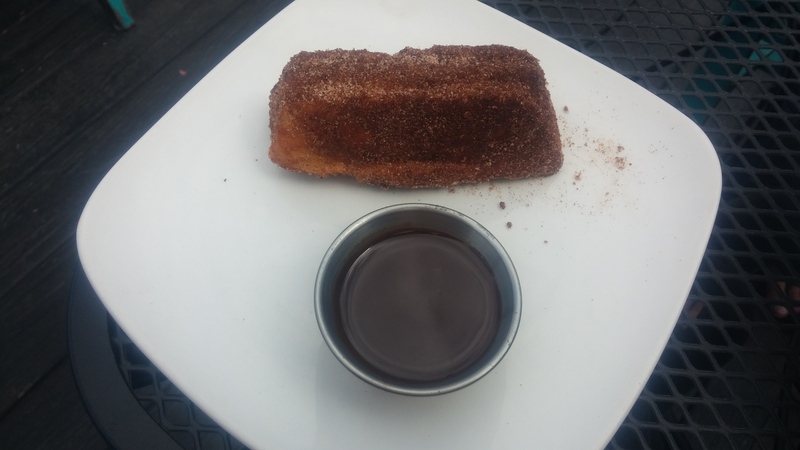 A really good one, covered in a thick layer of cinnamon-sugar, and then served with a chocolate-coffee sauce on the side. Which, may I say, was DIVINE. Silky, smooth, with that teasingly bitter flavor that makes you think of classic Mexican Cacao, all to dip and pour over your little ‘churro,’ which ate nicely (if not messily, and yes you MUST use your hands for this or you aren’t a proper Hombre). It’s not a churro on any real fashion besides the fry job and cinnamon, but it is still good for what it is. 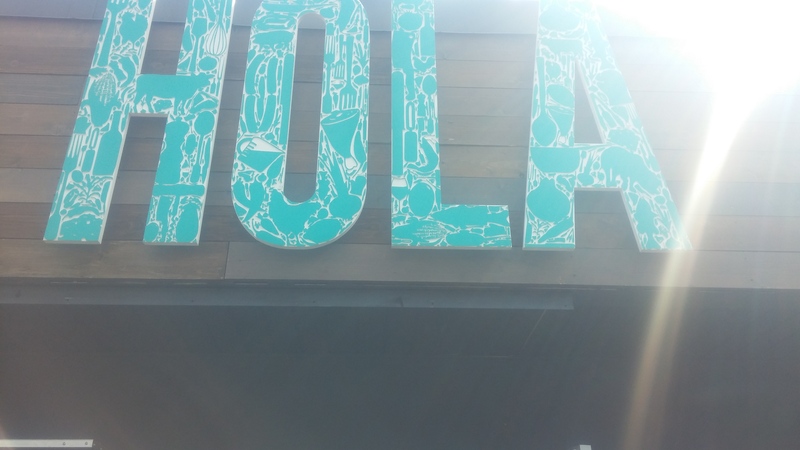 And that thus concludes my little round-up of my first, and hopefully not last, visit towards Hola Arepa. I know I don’t have to wish them any luck, so instead I shall simply set my feet, look forward, and continue on towards the next meal, wherever it shall take me. Certainly I hope you can do the same. Good Luck and Good Eating. 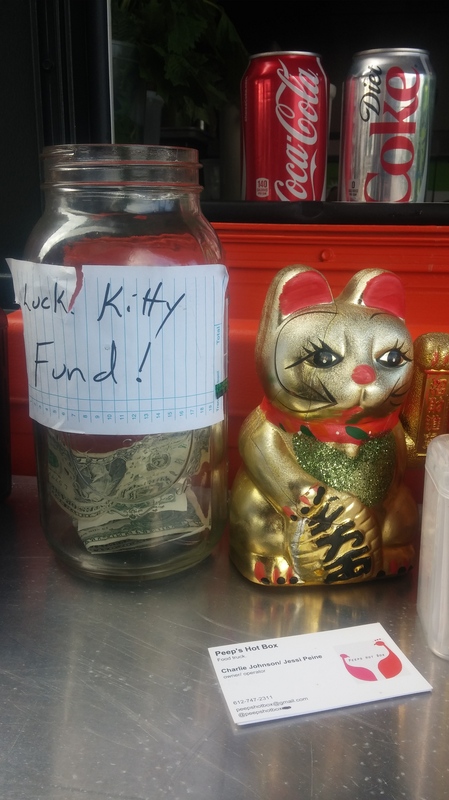 A recent article on M&R Trailer’s Blog site discusses a few of the food trucks that have taken part in charity work, in honor of the time of year, and I thought it’d be nice to share the link. 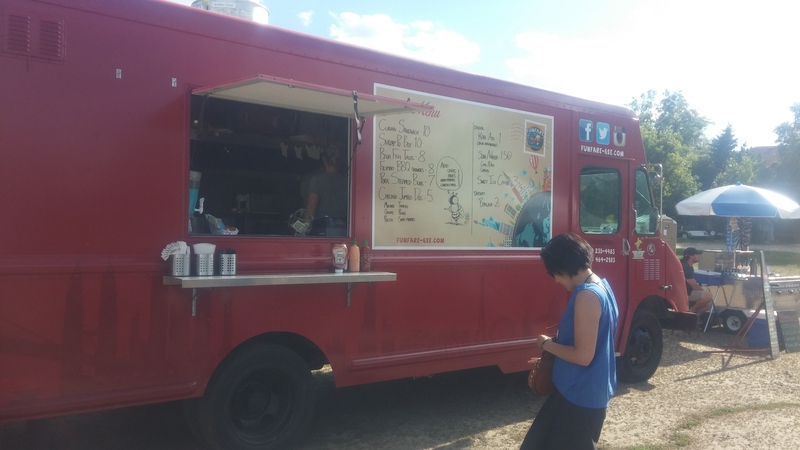 It features a few trucks located in or near Florida, like Manna From Heaven, a Vietnamese truck who set aside part of their profits for homeless meals. 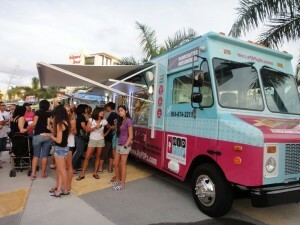 The post also includes interviews with a non-profit bakery called All Things Sweet, an old member of a charity truck group called ‘Food Trucks for Families’ named Sweet City Gelato, a business that seeks out as many charity-benefitting catering jobs they can to offer their HipPOPS to, and American Disaster Relief’s own Tamale Truck. It’s always great seeing people take the time to support local causes, certainly hope for all the best luck and support to them that I can. Another summer is slowly coming to a close, the days still sunny and warm but with interjecting weeks of chilled mornings, and thankfully the trucks are still on the streets in abundant number… in fact, they’re increasing. For as I was made abruptly aware one lazy afternoon, following a couple threads on my usual brewery-calendar-checking, thinking that I was close to finished with this year’s new-truck-explorations with only a certain mobile pizza business to go… and finding out I still have at least 5 more trucks to get through. 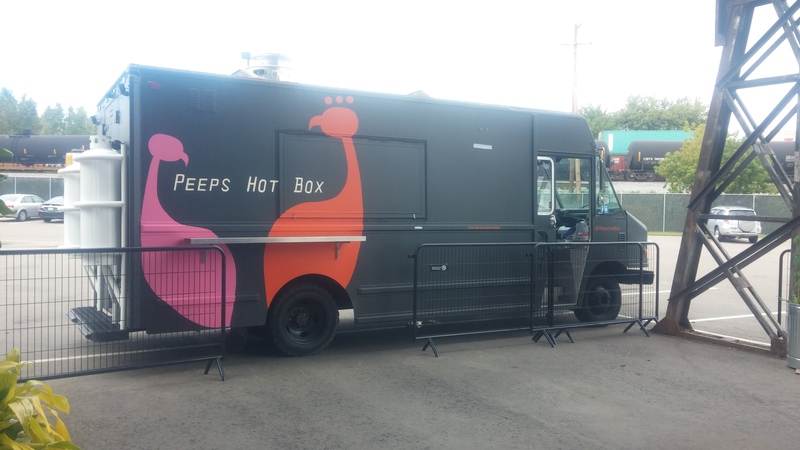 One of these trucks in my frantic year-end bucket list, and the only one I was able to plan a day for (gotta cross fingers on downtown trips), is Peep’s Hotbox. 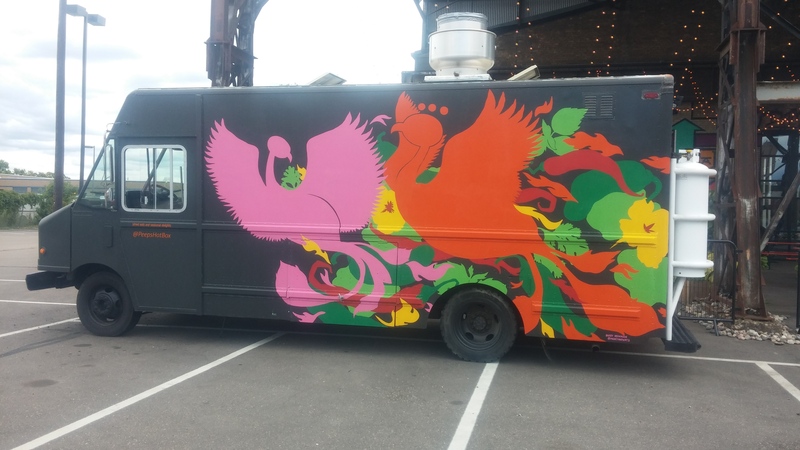 Showing up to its venues in a midnight colored van supporting a mural of rainbow-colored avians in flight, Peep’s brings an interesting site to the venues it vends from. And though it doesn’t contain any of the Easter-based candies (don’t you think it should around the holidays though? How fun would that be!? 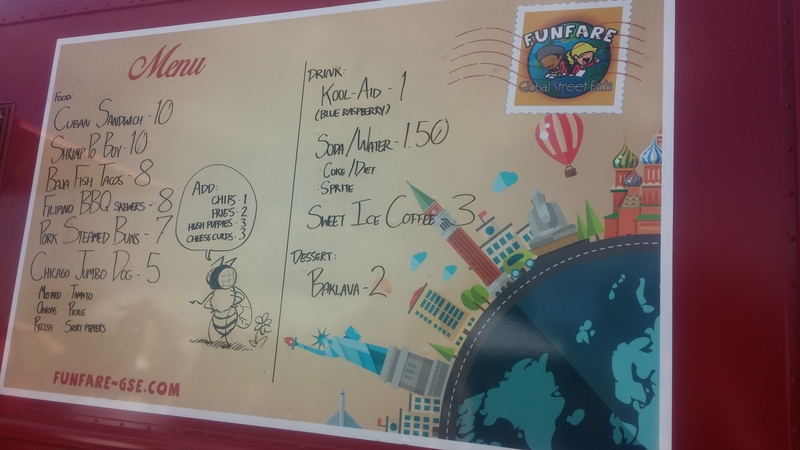 ), the menu brings an interesting moment of ponder to our day. I can’t actually figure out an official category or simple description for their offerings; there really is no common thread. If you read their Facebook page, it actually reads, under ‘Food Styles’: American, Breakfast, Japanese, Latin American, Mexican, Sandwiches, Vegetarian, Vietnamese… and there’s probably more they haven’t included, not to mention new items they might bring in the future. The one thing we can say is that every item is intriguing and has a feel of… scrumptiousness when reading. 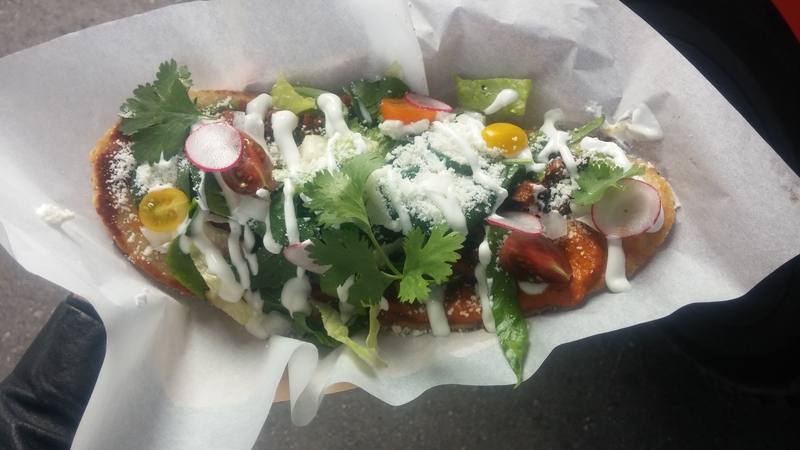 As for what’s on right now, the seeming forerunner (in my eyes) is a unique Mexican dish called Huaraches, offered using vegetarian Black Bean centerpiece or Pollo. 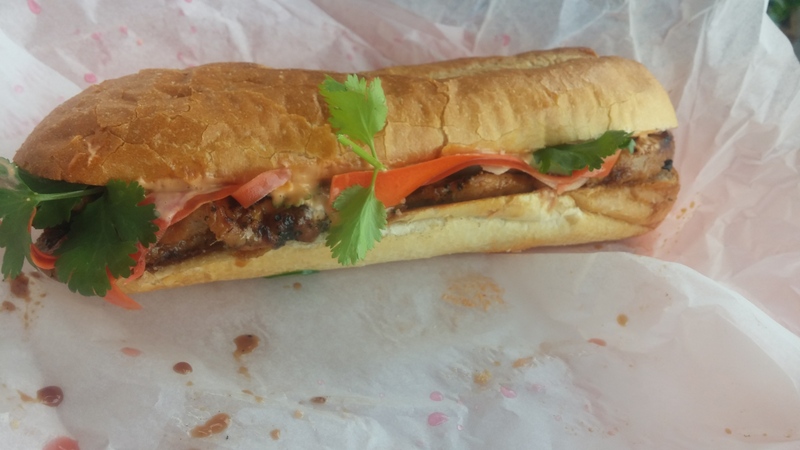 After that is a Pork Chop Sandwich, offered in a long, tight-clenched hoagie/bahn mi bun. 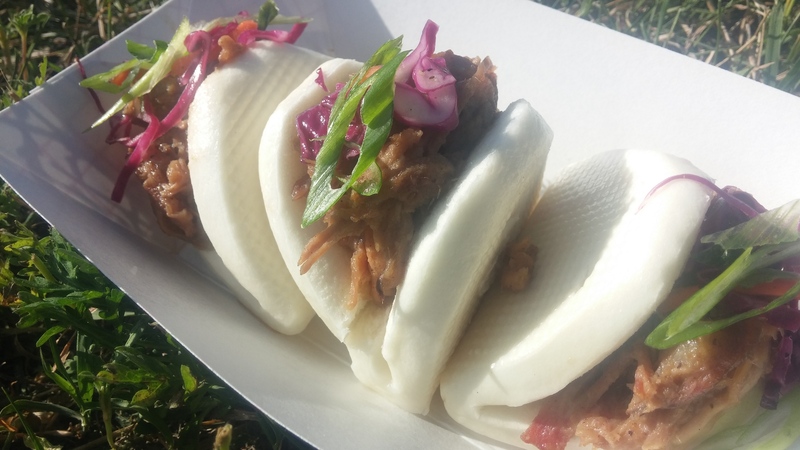 Other items offered, on and off, is a chicken thigh Yakitori, cups of Chili, Asian Noodle Salad, and an open-faced BLT with heirloom tomatoes in the good farmer market days. 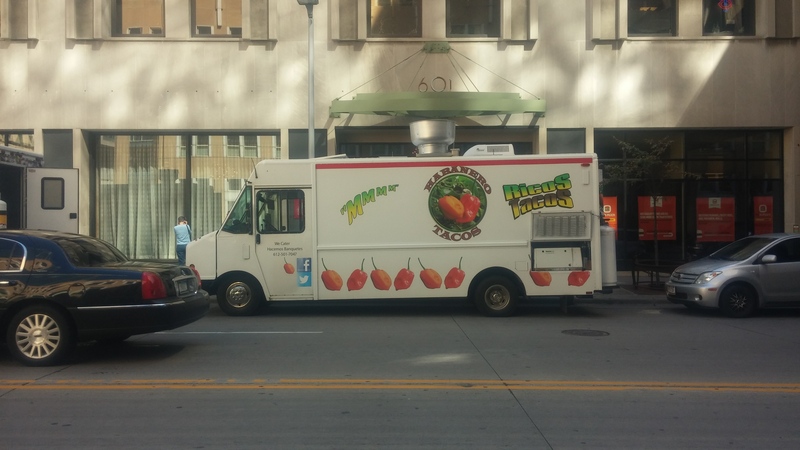 Chug this down with a can of refreshing Coconut Juice, San Pellegrino, or whatever brewery offering you happen to be at, and see for yourself what this truck entails. 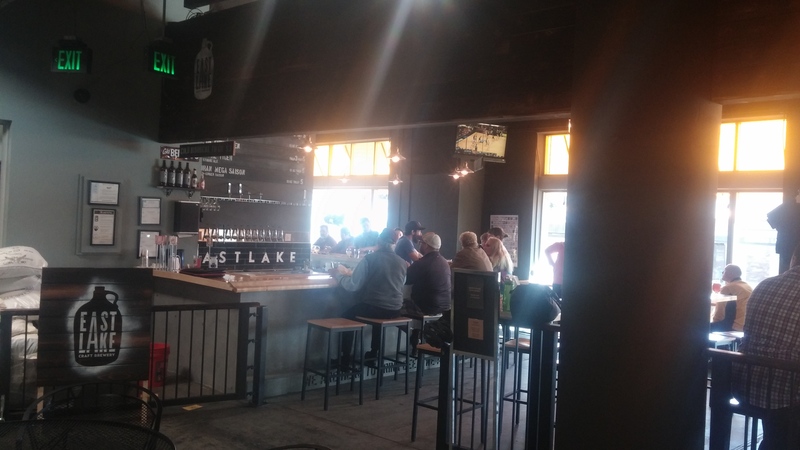 Though, for those that have yet to visit, here’s the reaction from my visit, also accomplished during my first trip to the recently-opened Bauhaus Brewery! 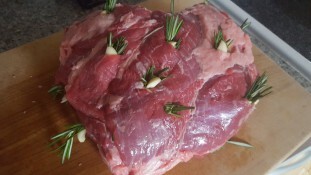 Well, let me start off by saying that if I had a category for Presentation then Peeps would have aced it! 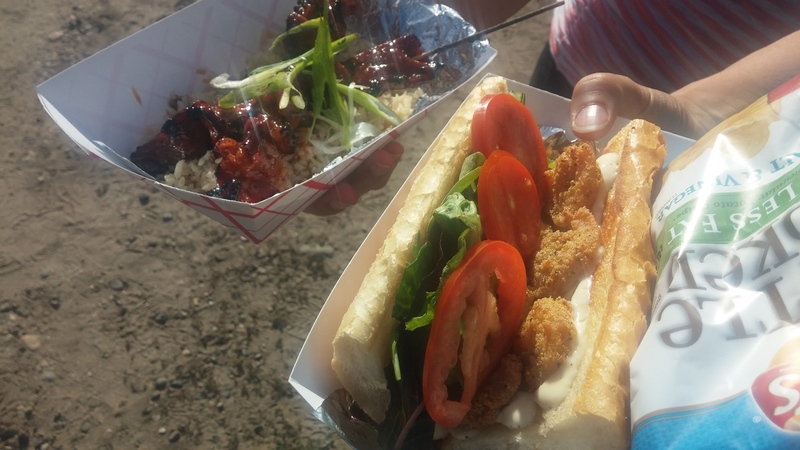 Man their food looks pretty, especially coming out of a truck. 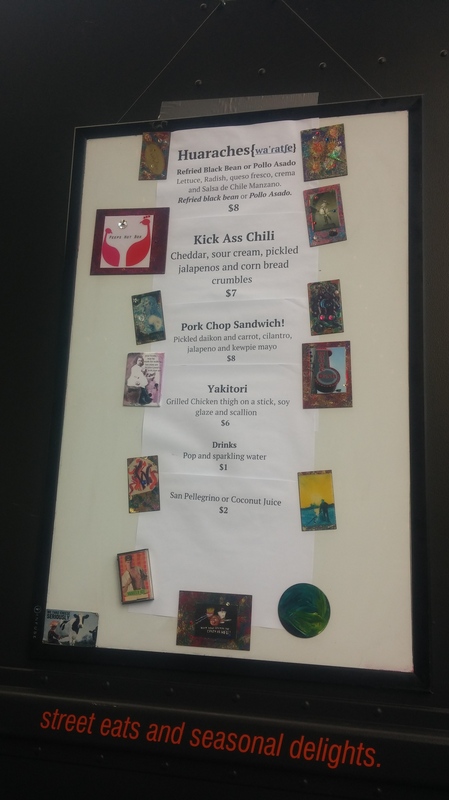 Sadly have not had the chance, yet, to try the Pork Chop Sandwich, but considering the results of the food here, other options and their seemingly high focus on palate-tantalizing fare, I bet it’s pretty darn good too. I’d actually want to try the yakitori too; I feel like they might actually do it justice, especially using only the flavorful, juicy dark chicken thighs. HIGHLY variable, it really depends on what item one gets. 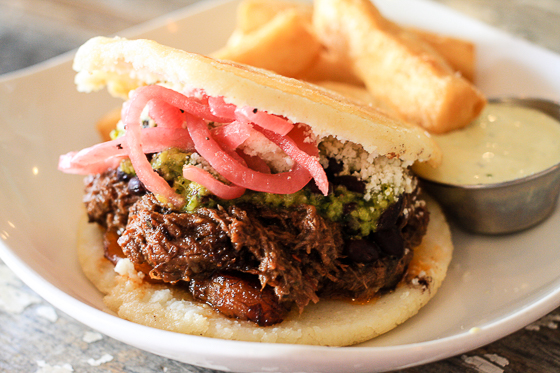 On one end, the pork sandwich is extremely carriable, one could probably only need one hand; while on the other, the huaraches… the idea of an oblong arepa base is fun, and could be holdable in a sense, but the whole dish is a big mess. Seriously, you need a knife and fork if you want to eat it properly, it just can’t be picked up without spillage and getting your fingers messy (which does have some appeal); not a bad dish for a brewery lunch. Then there’s a cup of soup, skewered chicken which may be coming in a basket, a thai noodle salad at one point… at the very least, one has their pick of items depending on their needs. $8 each for the main two entrees and $7 for the chili and yakitori; great prices overall, though I wonder if $7 is a bit much for these notably smaller items. A little longer than normal, not surprising considering all the little things they have to do for the sandwich and huaraches, but I don’t think I’d wanna be in a line with a few of those orders ahead of me. That said, wouldn’t be surprised if the chili and yakitori took quicker. 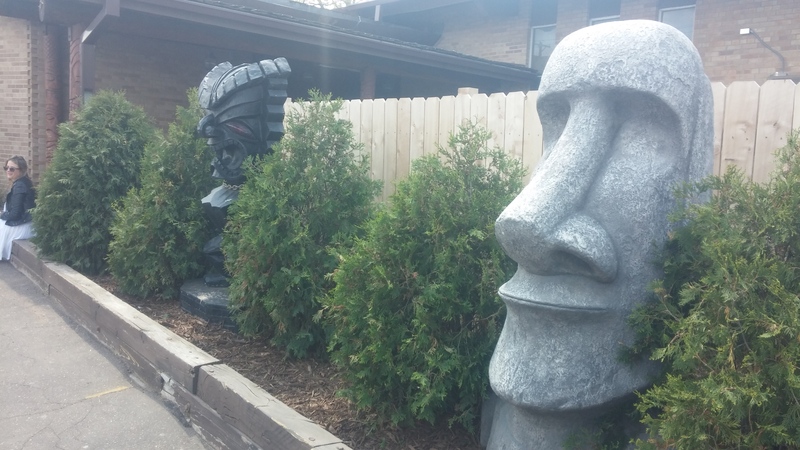 A strong, distinctive personality showing, intriguing artwork, and a set of delicious food that doesn’t really show a common thread amongst themselves. Pretty much sums it up, I’d like to be creative and offer another one of my long, eloquently off-again-on-again ramblings to delve into other things affecting the score, but I can’t think of much for this one. Maybe it’s just a lazy day? 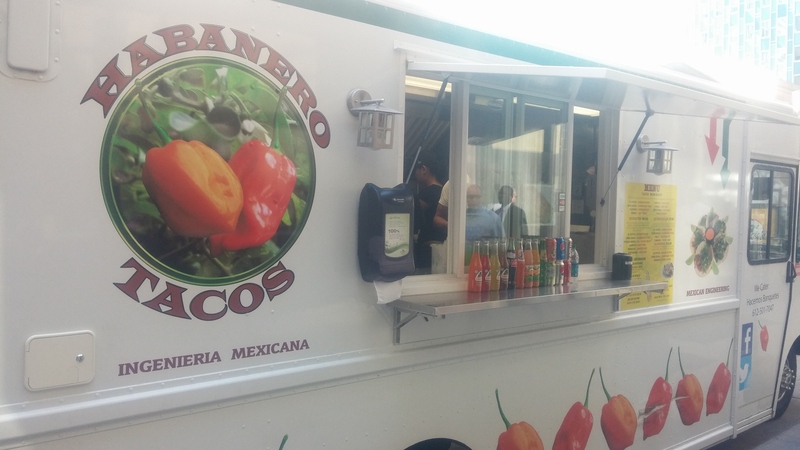 A Truck where one can find options to fit multiple needs, it’s a solid option for when one doesn’t know which mobile vendor nearby is suitable for their situation. 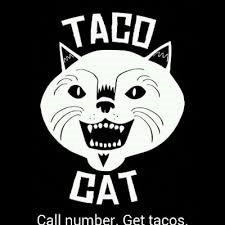 Or, if going to a brewery or other locale where it’s the only food option, one can go resting assured it’s a good limited menu to be stuck with. One simply has to know which menu items to get for their needs. 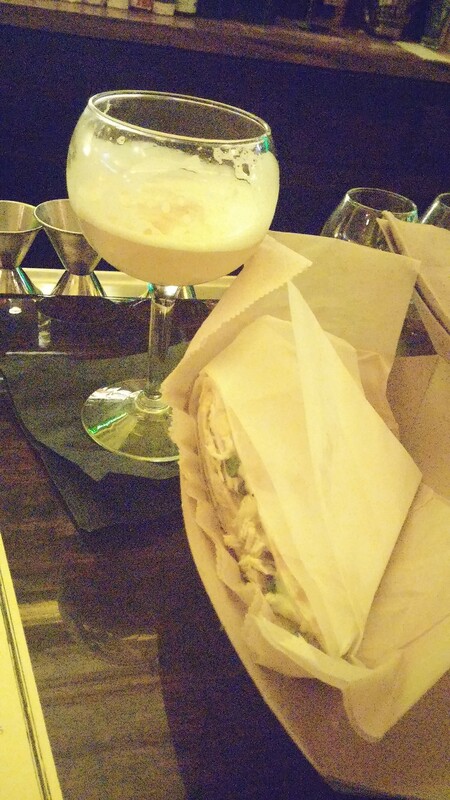 For the extreme travel-minded, the Pork Chop Sandwich is really the only, and best anyways, route to go. 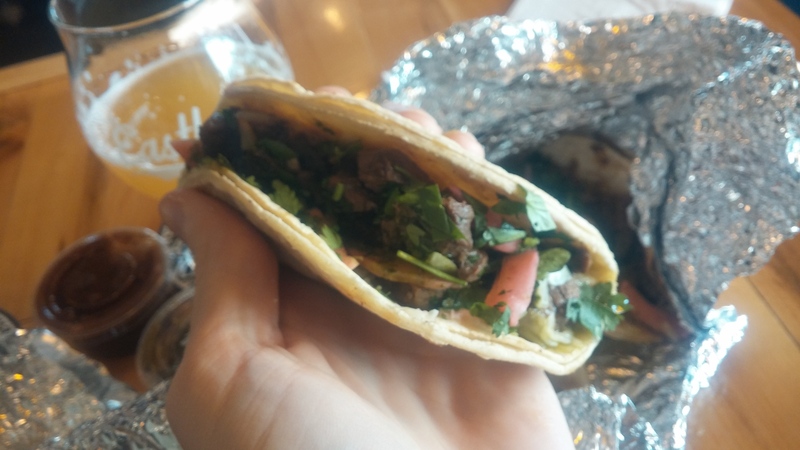 Though the Huaraches are much too messy, for now (here’s hoping they’ll fix it), they fit great in a brewery atmosphere or in any situation one wants and is able to sit down and focus on eating. When the day is cold, grab a warm cup of Chili, or a bright Noodle Salad when it’s hot. And when looking for something refreshing, an open-faced BLT or other item featured Heirloom Tomatoes is key. 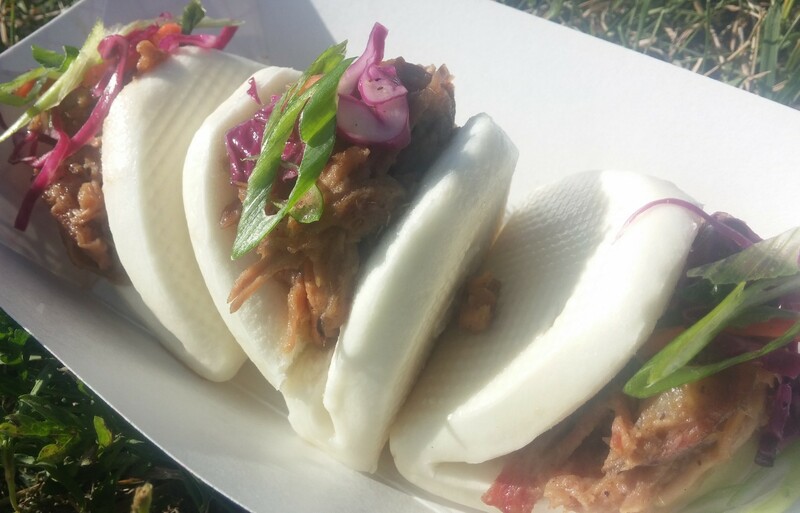 It’s not a place I would stop to represent and be ‘indicative’ of our street food scene, but if you just want some good food (street or otherwise) then it’s a keeper; I doubt there are any disappointing offerings. You know, it’s been bad enough as-is every time I’ve had to tell someone that I have yet to actually go to Psycho Suzi’s. 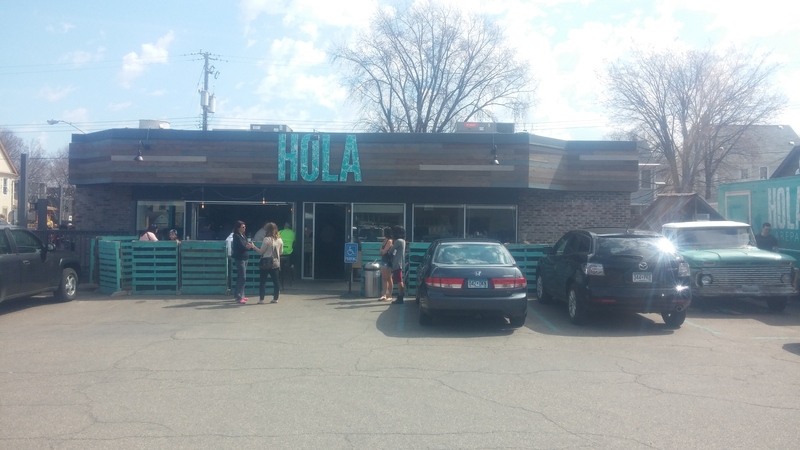 The shame and embarrassment of not being able to experience another one of the practically staple Minneapolis businesses to visit. Yes yes I know, it’s right in Nordeast, what’s wrong with me, they’re funky and already have another bar under their name, etc. I guess lack of money keeps one from the best night activities. And now I feel even worse. 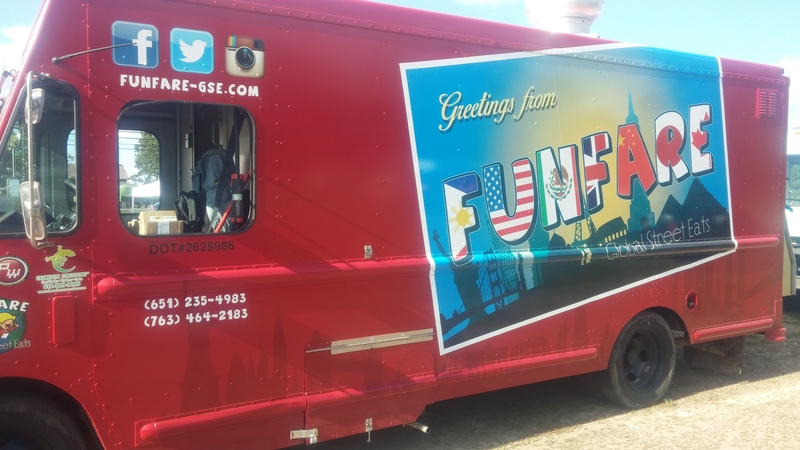 Cuz if I HAD started going to Suzie’s or their brother bar Donny Dirk’s, I probably wouldn’t have had to wait until April to find out about the Food Truck they started up. Donny Dirk’s is, after all, Undead Frank’s Zombie Bites’favorite nightly stop, usually hanging outside every Thursday-Saturday. Since the bar doesn’t seem to serve food, it’s quite the perfect arrangement (maybe Marvel should get their own food truck… now wait, they have snacks now. Darn); it’s definitely a fun experience to get one of their undead crafted cocktails with the forbidden edibles. Their themes do match after all. 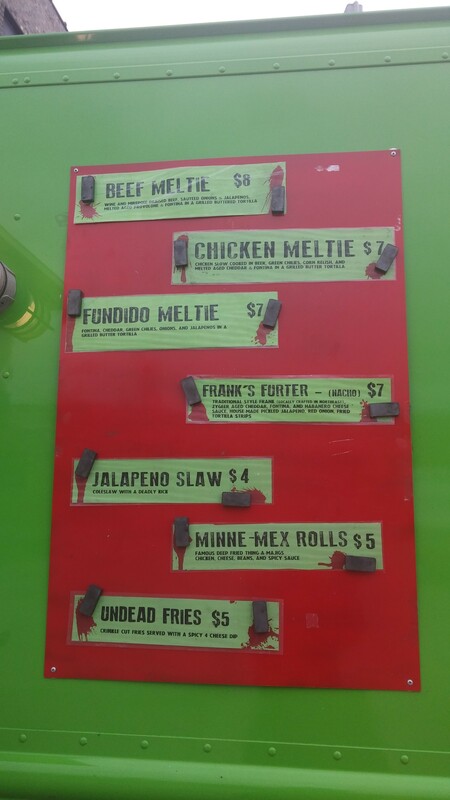 Along with a few interesting street food items (may I present 3 different kinds of “Meltie?” Chicken, Beef, and ‘Fundido,’ aka just cheese and veggies), Undead Frank’s mainly serves up various Bar Snack typebaskets. 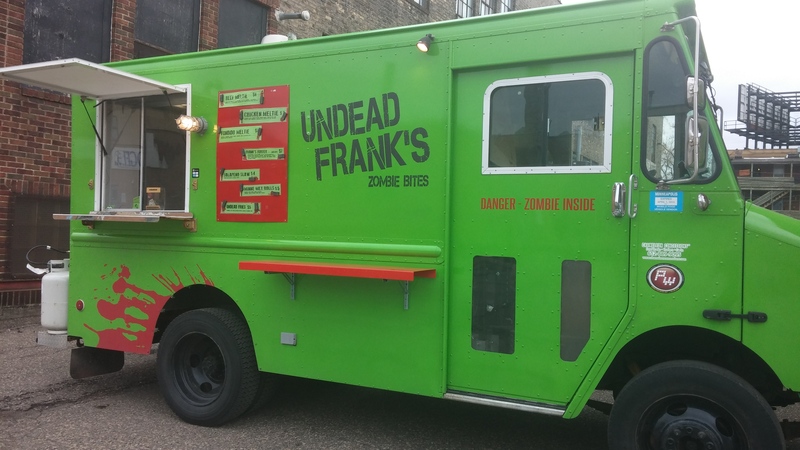 Mostly filled with their own truck-unique items; such as the Zombie Bites, “Undead” Fries and (handmade) Chips served with Cheese, Jalapeno Coleslaw, and a hot dog aptly named Frank’s Furter; they also bring back a much missed Psycho Suzi’s classic in their Minne-Mex Rolls. These babies disappeared from the restaurant menu some time ago to the chagrin of many regulars, so the Truck decided to bring them back. Round it off with a Cactus Pear Lemonadeand we have ourselves a fun addition to the quirky little Undead restaurant family. 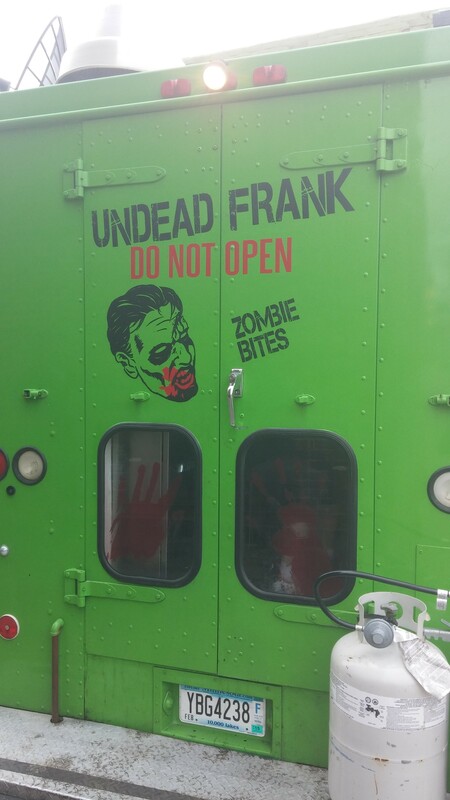 Accompanying the food, Frank’s truck is completely bedecked in a sickly zombie green, the blood of its recent ingredi… I mean, survivors, splattered here and there. Doctor Chefs are studded out in long grey labcoats, hopefully a sign they’re working on a cure between taking orders… either that or fine tuning a new chainsaw. My first foray with Frank’s took my straight to Donny Dirk’s about only 3 days after I found out about the truck. I say “first” because, sadly, the menu at the time did not include that one, single item which I truly needed to have; ‘dem Zombie Bites. 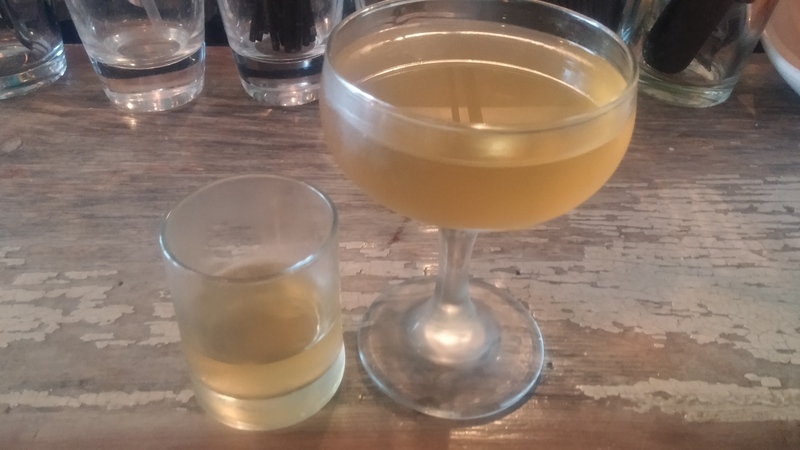 Not that it was a total loss, due to this I was able to try a few items, enjoy them with a friend and a cocktail (the Executioner: an apple-y, spicy whisky and egg emulsion, very delicious with the food), and come back again to get even more at the Art-a-Whirl (got some fun Tiki pics while there, as you can see). Quite a few things I’ve sampled here, let’s see if I can make this quick (for once). 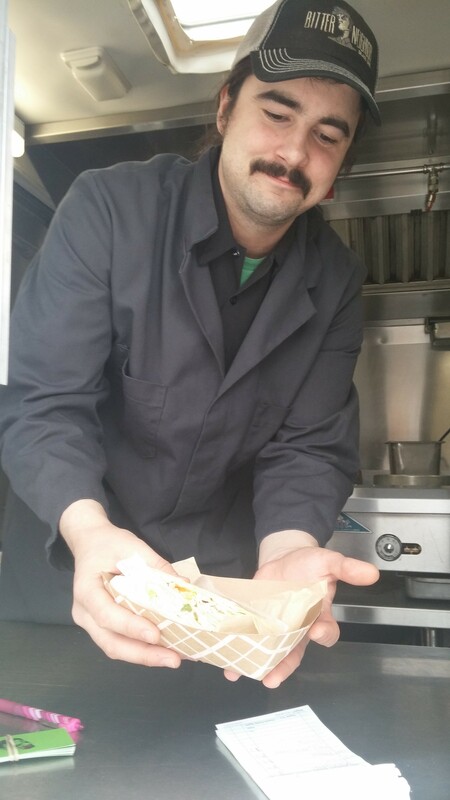 A great street food item is the Meltie; basically a burrito placed in a panini-like-press, a tight wrapping and crispy exterior enfold a tasty, “melty” filling. The filling was good, tasty, but there wasn’t anything too exciting about it; I was really looking forward to the “beer cooked chicken,” but none of that flavor actually came through. 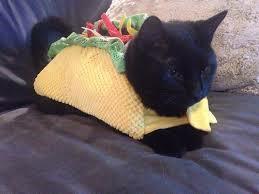 Still juicy and well cooked, it’s a well-made standard tortilla-based munchy. 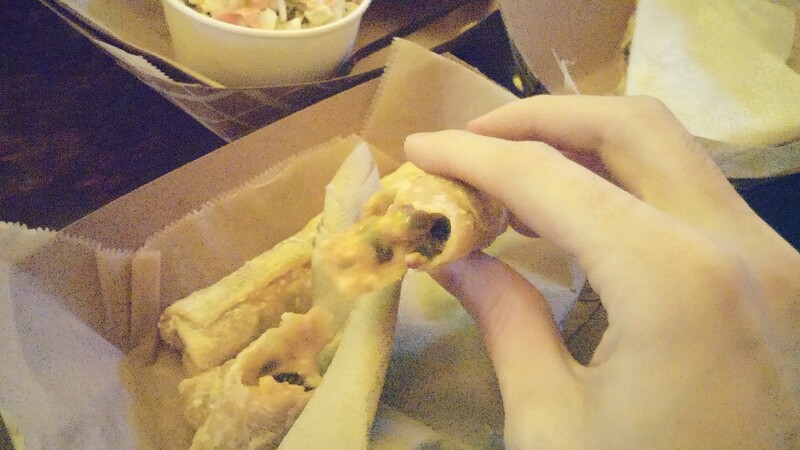 I can see why people were upset at Suzi’s demise of the Mex-Rolls; crispy-crunchy but sorta soft fried dough, a lightly spicy, gooey cheese and black bean filling. It certainly fit with the odd bar food theme. And they look like fingers. Buying just a side of coleslaw just feels odd to me, especially from a food truck (though it does at least fit my annoyed thoughts of people automatically adding sides to a mobile food and making it require a basket), but I can certainly say the Jalapeno Slawis about worth it. Its presence solves a conundrum I’ve been having for a while; what exactly makes a good quality creamy/mayo-based slaw? You can salt and drain the cabbage to absorb more, but then they get soft… or do you leave it fresh, but sometimes they affect the cream. Of which, what’s the consistency like? 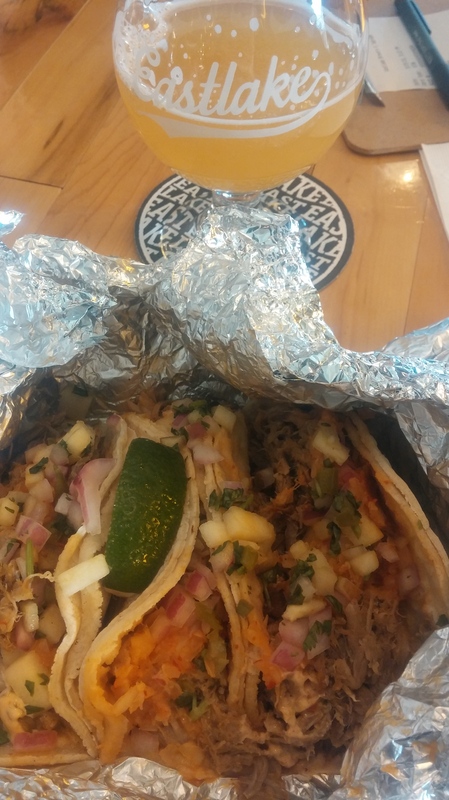 However it is, Frank has nailed it; crunchy cabbage, though there’s a liquid that settles into the bottom it’s not disgusting, the flavors are delicious with a good jalapeno-ness, and there’s still a nice creamy substance sticking to the outside. Maybe not the best description, but it tastes damn good; probably the best non-asian-style Coleslaw I’ve had (sorry for not keeping this one short). Do you see!? Do you see it!? It’s a Pizza Roll! 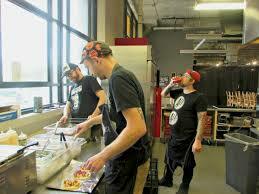 !They make their own pizza rolls! 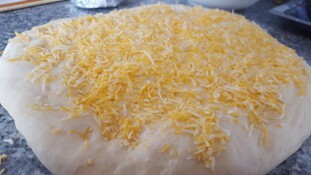 And it’s got the same thin, stretched-dough-crispy crust that’s absorbed the cheese and pepperoni fat, and the almost-homogenous red filling. 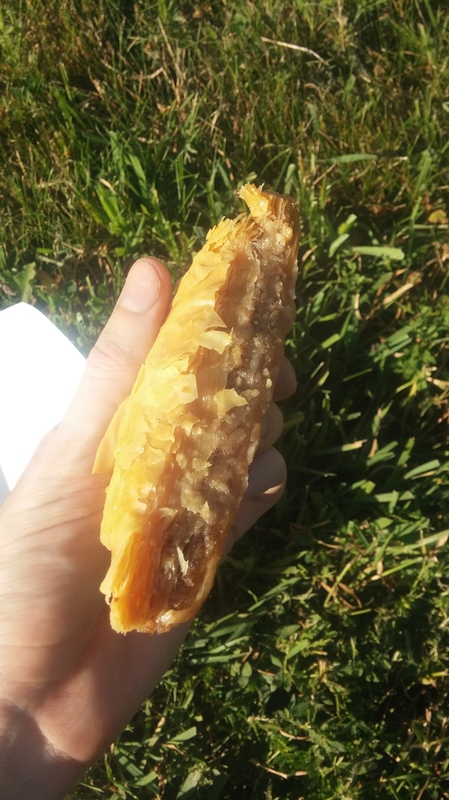 But it’s bigger, not as messy, sorta like an empanada version of it. I just loved it, total Nostalgia kick that I still enjoy; it’s definitely official, Undead Frank’s Zombie Bites have reached Toe Ringmaterial. Most items revolve around basket-based snack fair, all of which are pretty non-messy and easy to eat with the hands. 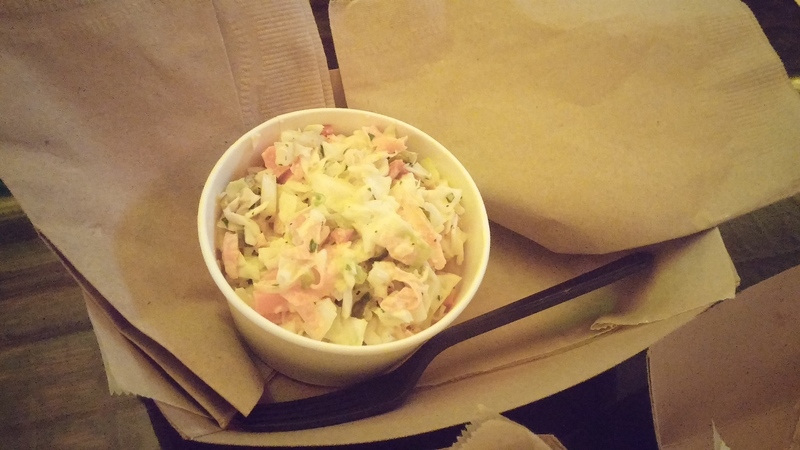 The Jalapeno Slaw is quite the oddity, being served in both a cup and basket; though I guess if one’s getting it for a side with other food anyways they already eliminate the ability to hold something in one hand anyways. I am a bit saddened that the Melties are automatically cut in half; otherwise they could have made ideal one-hand-only street item. Though they are still easy to pick up from the basket and go… could probably still do it with one hand, they’re pretty thin, sorta smush them side-by-side. 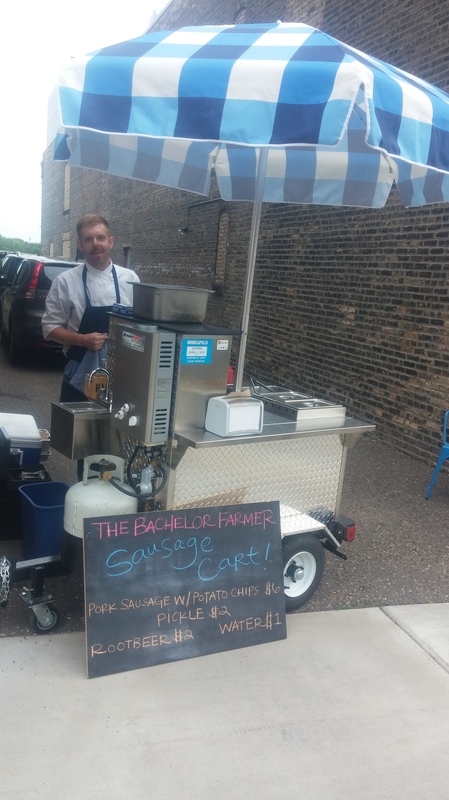 $7-$8for different Melties and Main Items (like the Hot Dog), with $4-$5 for Side and Snack-based things. Overall it’s a pretty good range, multiple items which hit the mark, though it feels like a stretch for others. 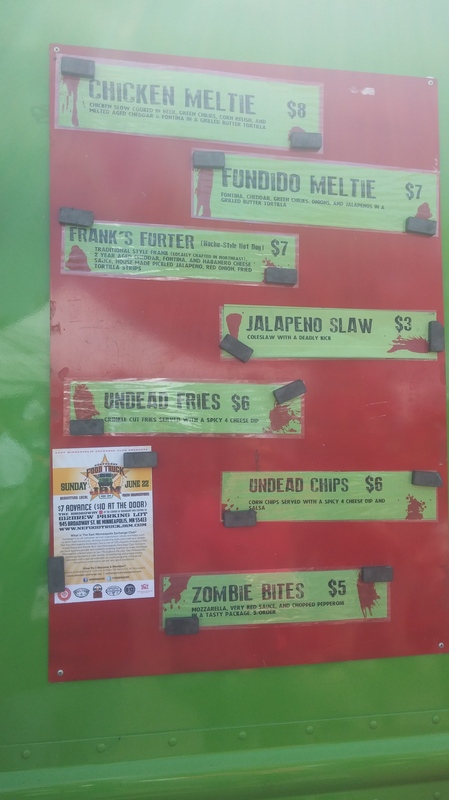 $5-6(it changes apparently) for “Undead Fries” or Chips, which are basically a basket with their cheese sauce, seems a bit much for a Food Truck offering, and the Hot Dog didn’t look big enough to justify $7 despite the toppings. Everything else seems about right though. About average waits for items. 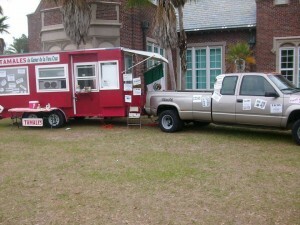 It is a ZOMBIE FOOD TRUCK! 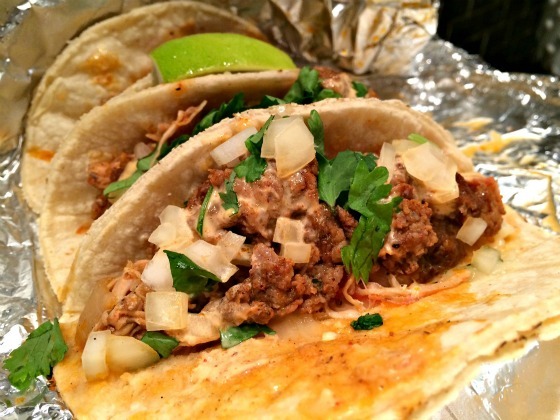 The food may not make you think of it so much (unless you look at it a certain way, though one could apply that to a lot of things), but the experience of going there is nonetheless absolute. Especially when enjoying them at Donny Dirk’s. Just what one could expect by the relative business of both Donny’s and Psycho Suzie’s; if there’s one thing they’re good at, it’s creating an “Environment.” Even got the window chefs dressed up in lab coats… simple, dank gray lab coats, but lab coats nonetheless (I wanted white with blood spatters! Whyyyyy!???). Oh, and don’t forget the Toe Ring. There are likely some small aspects, of the overall package, I could knock them for, but I feel everything else just launches them far enough over these indescrepencies that I don’t care. Hell, if I had higher tiers of scoring for this then Frank’s would be one of the guys up there. 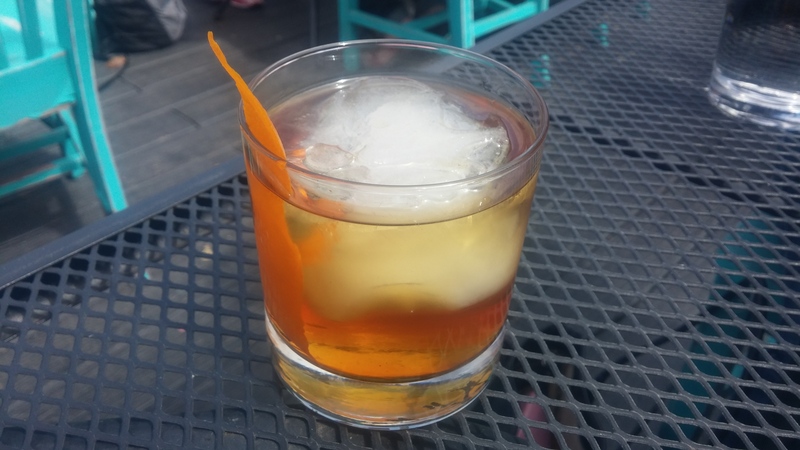 I really think the best experience here, much like Motley Crews and the breweries, is to head down to Donnie Dirk’s, grab a basket of your favorite thing to snack on at the bar, and enjoy with one of their fun cocktails. Zombie Bitesare obviously at the top of my list, many other are obsessed with the Mex-Rollsso I think they’re as much a viable suggestion here. That doesn’t mean they aren’t a great option on the street. 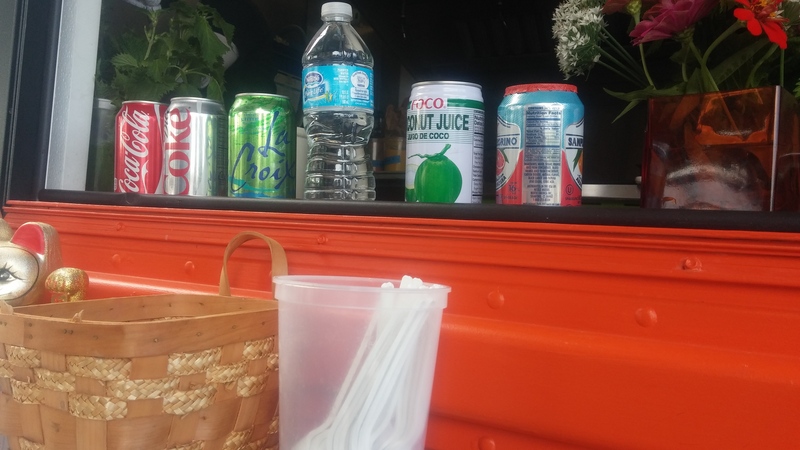 Though I haven’t had it yet, the Cactus Pear Lemonadeis near the top of my list for Food Truck Drink Options (it’s actually unique… hopefully it won’t go the way of the overused Hibiscus trend). Plus the Meltiesare strong, stable street food carry items with a unique package (compared to other options we have so far). They’re all good, but I feel like the Beefwould be my favorite.